Online Speech Therapy Help: Neuroplasticity: The power to change our brain! Neuroplasticity: The power to change our brain! Neuroplasticity is the unique ability of our brains to keep learning, to keep changing. New neural connections are made.. new learning takes place. This process happens even in damaged brains. Even after a brain injury or a stroke our brains have the ability to heal. To repair, reconnect and recover! Isn't that amazing? New research also shows that there are things that we can do to help this process along. Which means, by doing specific things, we can induce plasticity in our otherwise seemingly "static" brains. We now have the power to induce the changes that occur in our brains! 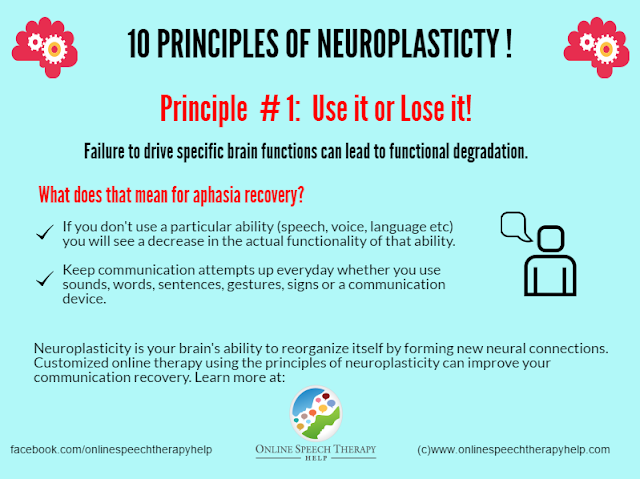 I am excited to share a series of posters that imparts basic information about neuroplasticity and specifically how that connects to aphasia recovery and aphasia treatment. These posters derive their conclusions from recent journal research and peer reviewed studies involving latest brain imaging studies like fmri and pet scans etc. Here's the first of the series. Stay tuned for the rest! For customized online therapy that uses these principles and evidence-based practice that you can receive from the comfort of your home feel free to contact me.